The subtle forms of an orchid petal were the basis for this still life. 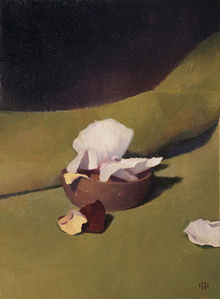 Capturing the luminosity of the white petals under a spotlight proved challenging. A careful balance of light & shadow was needed to accommodate the lighter tones of the orchid petal. The majority of this piece was actually painted twice. About half way through I realized it wasn’t heading in the right direction, scraped off as much paint as I could, and started over.